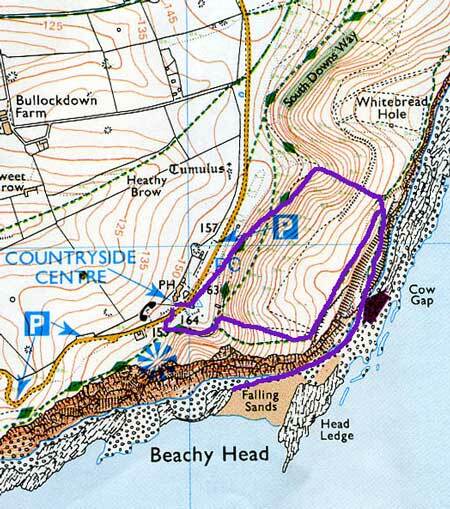 This walk (of between 2 and 3 miles) involves going onto the beach at the foot of the cliffs which is quite safe as long as you check the tide times and make sure that you are walking in the period from 2 hours before to 2-3 hours after low tide. The chalk grassland on the cliff top is rich in plants and creatures and the air up here is as fresh as any in England. The beach below the cliffs is unique – formed by the meeting of several different kinds of rock, and the rock pools are full of creatures and plants. It’s an ideal walk for children, with lots of scrambling and dramatic, varied scenery. It’s not very good for dogs, especially the rocky section at the foot of the cliffs. There is a steep climb at one point. The start point can be reached by the 713 bus from Brighton or Eastbourne in the summer months. It’s also possible to start this walk from Holywell at the western end of the Eastbourne seafront, and this start point is served by buses all year round. Explorer map 123 shows alternative paths. There are toilets and a pub (and sometimes a cafe) at the Countryside Centre at the start point. Cross the road in front of the Beachy Head Countryside Centre and turn left (towards Eastbourne). See The Countryside Centre story below. Walk along the path that runs parallel to the road and if it’s spring or summer you’ll notice the wonderful richness of downland flowers and grasses. When you reach the end of the scrub on your right, follow the path around and downhill until it branches into three possibilities. Take the middle path which goes steeply downhill towards a holm oak tree. Cross a grassy track and continue to the left of the tree. Ahead on the edge of the cliff you will see the footpath sign that marks the steps down to Cow Gap. Head towards this sign, in summer walking amongst butterflies, crickets and grasshoppers as you go. Take the steps down towards the beach and follow the path until it forks. Take the left fork and continue, staying on the main path. Linnets live in the scrub here you can hear their singing and sometimes see them flying from perch to perch on top of the bushes and thistles. Wheatears are seasonal visitors too. See Wheatear Pie story below. Eventually the path will bring you to a steep set of steps down to the beach. Turn right and make your way as far along as you want to go. The best rock pools are on the ledge that goes out to the east of Falling Sands – the stretch of golden sands within sight of the lighthouse. See Shipwrecks, Parson Derby and the Lighthouse story below. Return along the beach to the steps up at Cow Gap. (It is possible to continue to Holywell and thence to Eastbourne – about another hour’s walk.) If you are returning to the Countryside Centre and want to vary your return route, turn left just before you reach the last set of steps up to the Cow Gap footpath sign. Climb to the cliff edge and continue walking away from Eastbourne, i.e. with the sea on your left and the fold of the hills on your right. The path leads you towards a steep climb up to railings round a viewpoint which is part of the Peace Path that allows wheelchair users and buggy pushers to see the lighthouse. Turn left on the tarmac path and follow it until you pass a bench. Climb up the grassy bank to the right and you will find yourself more-or-less opposite the Beachy Head Hotel and Countryside Centre. It is possible to start and finish this walk at Holywell (named because of a chalybeate spring) at the west end of Eastbourne seafront, which is accessible by bus from central Eastbourne. In this case, the walk leads westwards along a choice of clear tracks through Whitbread Hollow and then to the cliff edge at Cow Gap (see above). All the routes involve some climbing and long views – it’s almost impossible to get lost. See Whitbread Hollow Allotments story below. The Countryside Centre was once a signalman’s cottage, built by Lloyds of London for shipping reports. On December 10th 1994 I came to do a storytelling session here on a wintry, profoundly foggy day – I came by train and cycled up the hill. Just before the stories were due to start, the fire alarm bell went off, and everybody thought it was a drill. We went outside as instructed and waited in the very wet fog for the all clear. It took a few minutes standing there shivering to realise that there was a strange crackling sound coming from the building (which we couldn’t see even though we were close to it) and that the mist was not just mist but also smoke. It was a big fire (it started in the pub kitchen) and in it I lost my coat, bag, purse, storytelling props, bike (which had been parked by the wall) and train ticket. I had to be taken to the station by a policewoman who kindly bought me a ticket – when I said that mine had been lost in a fire the ticket collector’s response was, “You can’t go on the train without one”. It is said that during the rule of Oliver Cromwell, the residents of Bourne Place, Eastbourne were secret Royalists working for the return of the monarchy. Cromwell sent a troop of soldiers to the house to search for incriminating evidence. When they arrived a newly baked wheatear pie was steaming on the kitchen table and the mistress of the house saw that the men were drawn to the savoury aroma. She offered them a plate of pie each and they ate with relish – wheatear pie was considered a great delicacy. What the search party didn’t realise was that, while they were eating, in another room the master of the house was burning documents and letters. The search revealed nothing untoward. Wheatears are migrants who reach the southern coasts of the UK in March and April, on their way from Africa to their breeding places in Northern Europe. They use rabbit holes and other ground hiding places and feed on insects. So why “wheatears”? It seems that the country name for them was “white arse” – a much more accurate description, but one that offended Victorian sensitivities. Huge numbers of the birds were trapped for food until the 20th century. They can still be seen in spring on the cliff tops along the Sussex coast. The seas around Beachy Head are dangerous with unpredictable currents and winds and many ships have been wrecked nearby. Jonathan Darby became curate of St Michael’s church in Litlington in 1692 and later, Rector of Wilmington and Parson of Friston and East Dean. His duties included the burials of bodies washed up from wrecks, which happened often enough to sadden him and to arouse his compassion. There are stories that some of the ships were wrecked not just because of mists, rocks, currents and raging seas, but because the sailors were deliberately misled by people on shore. It is said of this coast, as of coasts in Cornwall, that people used lanterns to confuse sailors on ships in trouble at sea in stormy weather. Parson Darby was appalled by the number of shipwrecks and drowned sailors and he knew that what was needed was a reliable, fixed light that would warn the men at sea of the whereabouts of the coast. So he excavated “Parson Darby’s Hole” in the caverns that already existed near Belle Tout. He created a chimney that led up from the coast and “rooms” above it where he set lights on ledges on stormy nights. He often spent whole nights in his caves watching the sea and many lives were saved. There is evidence that the Parson was saddened by the deaths of 2 children in infancy in the early years of the 18th century and then that of his wife in 1723. He died in 1726 and is buried in Friston churchyard beneath an epitaph: He was the sailors’ friend. The cave became a place of curiosity, almost pilgrimage for a while after his death, and then was used by smugglers, as were any useful hiding places near the beach in the 18th century. In the early 19th century an East Indiaman was wrecked off Beachy Head though its crew was saved and a Royal Navy captain petitioned the government to take action to protect its ships. A light was set up in a hut at Belle Tout in 1828 and in 1834 a permanent building housed a stronger light visible miles out at sea BUT only in fine weather. There is often mist and low cloud over the downs here, and at the same time as high winds and storms too, so a light on the cliff top was obscured sometimes when it was most needed. So, in 1899, it was proposed that a lighthouse be built at the bottom of the cliff where its light would be enhanced by the surface of the sea. Its building required an aerial “railway” system to hoist materials (including 720 blocks of Cornish granite) from the cliff top to the beach, and a dam around the work to prevent the tide from flooding the site. There was a stone platform so that boats could moor, and a tower 120′ high. The light began operating in October 1902 powered by paraffin. In 1974 electric cable was laid underground to power the lighthouse and in 1983 the whole operation became automated. Up until that time, there had been 3 lighthousemen who worked 4 week shifts living in the tower. Until 1984, the lighthousemen had played a large part in alerting Coastguards to people in difficulties on and beneath the cliffs. There is a story of a climber from the 19th century who reached a halfway point and found himself unable to continue up, or to climb down. He couldn’t attract anyone’s attention and had to stay on a narrow ledge all night. He felt, probably rightly, that if he fell asleep he would fall to his death. He spent a terrifying night, so cold that he could hardly cling to the ledge and was rescued in the morning when men on a fishing boat saw him. He was a young man in his thirties who recovered from his trauma but was left with a permanent reminder – his hair had turned pure white. Before the mid-20th century many people explored the pleasures of rock climbing in the UK and the chalk cliffs at Beachy Head were considered a very challenging climb. This is because the cliff face is sheer, the rock crumbly and unstable and the whiteness of the chalk almost blinding. There were several chalk pillars standing split away from the cliff, known as the Charleys, and one as the Devil’s Chimney. These gradually eroded and fell into the sea – all were gone by the time the lighthouse was built in 1902. There is a photo in “Beachy Head”, by John Surtees, showing Aleister Crowley and a companion on top of two of these pinnacles in 1894. He climbed them several times, once having to be rescued by the coastguard. The Coastguards, the police and a team of volunteers have been involved in countless rescues at Beachy Head and have developed considerable expertise alongside their bravery in risking the dangers of the cliffs especially when distressed and unpredictable people are involved. Although a notorious spot for suicides, by no means everyone who jumps is killed. Quite often people land, with serious injuries, on ledges from which they have to be rescued. One woman’s fall was broken by a fridge that had been pushed over and had wedged itself partway down. Sometimes people are perched on crumbling, slippery ledges from which it takes hours of skill and courage to deliver them. Statistics given in Surtees’ book show that there is an average of more than 1 death per month here, that June, July and August are the worst months, that men are more likely to commit suicide here than women and that more than half of all the people who do this travel from outside the county. The great dip in the land between Cow Gap and Eastbourne (now occupied by sports pitches) used to be allotments. Farmers and landowners were keen to ensure that allotments should not be too big. They needed to be able to employ agricultural workers at busy times of the year (and lay them off when it suited too). If the workers had sufficient land to grow food for their families and to sell some, or keep poultry or pigs, they might become independent of the farmers and this would not do. The size of allotments (20 rods) is based on the notion of a plot that can be cultivated by spade (rather than plough) and that will feed a family but no more. John Stuart Mill pointed out that allotments were “a way of making people grow their own poor rate” and didn’t think they were a good solution to the problems of the poor. He said that where employment and wages were good, there was little demand for allotments.